I'll list the specifications and then the issue I'm experiencing, following with my reason for doing this. Any input or ideas would be grateful. Reading from the pool is introducing checksum errors and is corrupting data in a striped mirror pool. I copied over roughly 3 TB of data into the pool with no issues. However, once I wanted to copy out a few of my datasets (e.g. moon/home/user) I got two CHECKSUM (CKSUM) errors while doing this. One was a zip file, the other a jpeg. I opened the copied image file and indeed 80% of the image was intact with the remainder of the data scrambled. At this point I had 2 data errors and less than 10 checksum errors for the entire pool. I decide to do a scrub with zpool scrub moon. The scrub finished with around 40 checksum errors with ~1.68M repaired. I was expecting the scrub to fix the two files, but after the scrub there are now 43 data errors. Output shown below is the filesystem running a second scrub of the pool. Almost halfway through the scrub there are now 80 checksum errors in the pool. I looked up out ZFS handles cache flushing, and how VirtualBox handles cache flushing. ZFS issues infrequent flushes (every 5 second or so) after the uberblock updates. The flushing infrequency is fairly inconsequential so no tuning is warranted here. ZFS also issues a flush every time an application requests a synchronous write (O_DSYNC, fsync, NFS commit, and so on). Kernel Panic. The VM crashed, and I'm adding this as informational. panic: Going nowhere without my init! Prevention from bit rot, and a cooler storage of data with compression and deduplication. This is my everything-station; I use it as a server and a workstation and I like to find a balance of pushing the most utilization out of it in a single contained tower case that also looks nice. I also have no room for server racks, so this is the most compact solution. Last edited by naisanza on 11. Apr 2014, 21:54, edited 2 times in total. Ever heard of the K.I.S.S. principle? 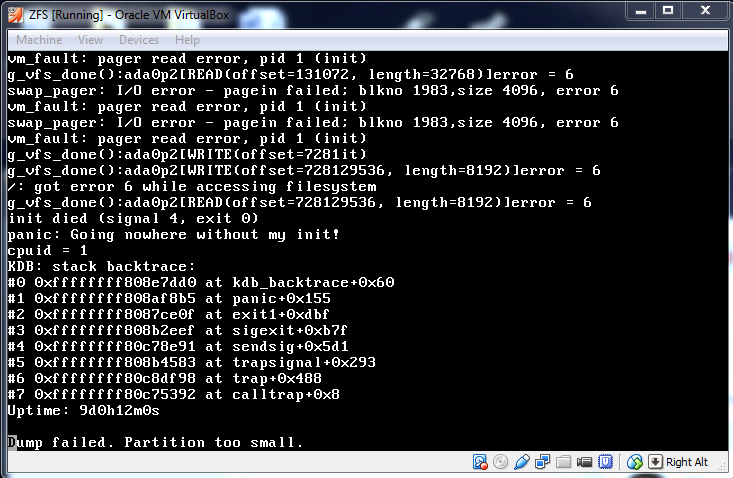 You're throwing in the mix virtualization, FreeBSD, ZFS. If something breaks, who do you blame? a) How many people do you think are doing that? Chances are, not that many. Cross-posting won't help you either. Warning: Raw hard disk access is for expert users only. Incorrect use or use of an outdated configuration can lead to total loss of data on the physical disk. I know I'm not offering a solution, but chances are that you either have to hunt this down on your own, or (if you're sure) raise an issue in the bugtracker. socratis wrote: Ever heard of the K.I.S.S. principle? You're throwing in the mix virtualization, FreeBSD, ZFS. If something breaks, who do you blame? haha yeah I've heard of it. I don't want to blame anyone, I just want to try to use the technologies that are available to the best of my advantage. I had an idea and who knows who else was trying the same thing. If no one has, I suppose this is just more information to feed onto the Internet. It doesn't hurt anyone to try. Doing something new means learning something new, so for me that makes me happy. Thanks for the suggestion, I think I'll send in a bugtracker and see where it goes from there.